The Louisville Slugger Select 718 is a 2 piece hybrid featuring an alloy barrel and composite handle. This gives the feel and sound of alloy without the high vibration you get with a one piece. Slugger didn’t release a 2017 version, but brought it back for this year due to a demand with college players. It is Slugger’s only hybrid bat in this year’s lineup. Louisville Slugger always does a great job of combining a lot of color into their bats. The 718 is no exception and includes a combination of silver, dark gray, black, red, and sky blue. Slugger did a great job of including a bunch of smaller graphics and logos as well that liven up the look. The new SBC endcap has an interesting look. The custom Lizard Skin grip is also a great touch. The knob on the 718 has a thinner, traditional shaped knob. The handle has some taper into the knob. The grip is a custom Lizard Skin that feels like the 1.1mm thickness. Lizard Skin’s grips are incredibly popular at all levels of baseball. Their reputation should speak for itself, but if you’ve never had the chance to swing with one you can trust that you’re going to get a firm, comfortable grip. Louisville made this bat very comfortable to swing. The thinner knob rested comfortably against my bottom hand and the Lizard Skin did its job perfectly. The Select 718 is an endloaded bat that had the heaviest swing weight of the endloaded bats I tested (DeMarini CF Insane, DeMarini Voodoo Insane, Rawlings 5150). It was designed for stronger hitters who can handle the additional mass in the barrel. The biggest knock against the 718 is its barrel size. Its main competitor, the Voodoo Insane, has a barrel that is nearly 2 inches longer. I asked some players who already swing the 718 if they wanted a bigger barrel. Most of them didn’t care since they want to get extension, and if they make contact near their hands on the extra 2 inches the Voodoo offers, it’s not going over the fence anyway. 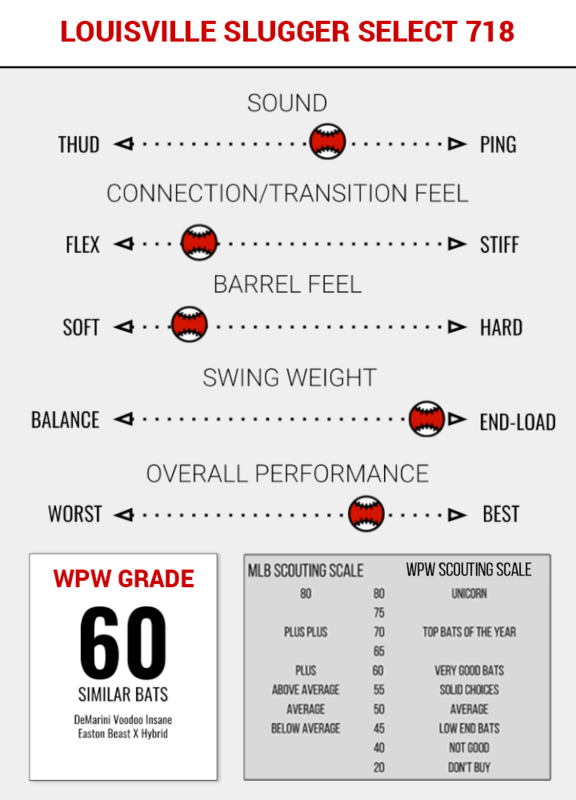 Weight wise, this is a man’s bat, and I don’t recommend it for players who haven’t grown into their bodies yet. The 718 performed well in cage testing. The alloy barrel needs no breaking in and will perform right away. Louisville’s new TRU3 connection technology allows the handle and barrel to move seperately from each other during your swing. This has created a ton of flex, and the bat really whips through the zone. It’s also knocked out most of the vibration on contact, which gives the bat an extremely soft feel. When you make contact, it produces a softer toned down ping. My main piece of advice is to make sure you’re strong enough to swing this bat. If you’re not, you will get jammed a lot because of the shorter barrel and high weight. However, if you’re strong enough and really focus on getting extended and making contact in the right place, balls will be flying out of the yard. Louisville Slugger should be proud of the work they did with the Select 718. You will see a lot of this bat in college games and in the hands of stronger high school hitters. If you’re positive that you can handle the extra weight, take a good look at the 718. Shop the Select 718 here.